इस लेख का मूल्यांकन करे With so many different ways to play games these days it can be hard to choose which is best for you, today we will cover games that you download, and bring you examples of some of the best downloaded virtual worlds. When you think about downloading a game, it may seem like it is a lot of effort or complicated to do, in reality it is very simple to place one of these games on your computer and then play it. There are easy to follow instructions, and some games even use the same program and you simply select it from a list when the game is installed. As you look at the websites for the game, there will be button on the screen that will take you to the download file, all you need to do is follow the instructions on the screen and the boxes that appear on your computer. Once you have it all set up and running you can then play the game you downloaded. There are a few benefits to these games, including a better and bigger world to explore, many more options for your avatars and many of them give you the chance to own a piece of virtual space of your own where you can do what you want. Another benefit is once you have the software installed you can jump in and out whenever you want without having to wait. One of the very best things about a downloaded game is how good they look. With other types of game you are limited in what you can do and how good the graphics can be, with a downloaded game there are no limits. These worlds are all brought to you in beautiful 3D and they feel brilliant when you play them. This level of detail just can not be found elsewhere, and is one of the reasons many developers create games to download, because they want their game to look and play really well. Now we have discussed the benefits of downloading games we feel it is time to bring you some of the best downloadable virtual games. Each of these games will ask you to put it on your computer, but when you do you can immerse yourself into a space you can truly call your own. With Onverse you are able to explore a stunning world with your own car. Drive around the hottest nightspots, or visit your friends apartment across town. 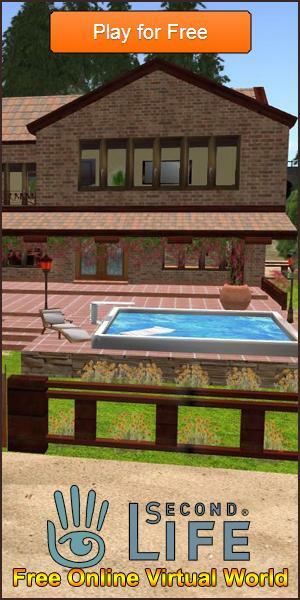 Alternatively you can take a stroll around the beautiful parks or shops that make up this fun virtual world. IMVU gives you a space to call your own, and in it you can do anything you want from making a simple log cabin to the biggest castles wth its own dining hall and 20 bedrooms. As well as your own island there are thousands of cool places to visit and hang out where you can meet new friends and just enjoy yourself. one of the newest virtual worlds Virtual Highway has managed to create a really great looking place to explore, with really high quality graphics and lots of places to enjoy. You can also create your own shops to sell good you make using the program you download, simply add in your designs and then sell them to your fellow players. In Blue Mars you get a little more than you expect with the option to make a whole city in your own image. You are given the opportunity to take an empty space and fill it with the town or city of your dreams. Full of shops, clubs, homes and parks the whole place is yours to design. And of course you can go and see the cities of other people and see what great places they have for you to hang out in. A little different from the rest Roblox is a space for you to create games as well as places to explore. Here you can use your creativity to make anything you want, you can also invite your friends in to help you and together you can build anything. The best thing is that all of the tools you need to make it are included in the original download, so you just log in and make everything in a really simple to use way. And so we finish our list of the best games with perhaps the biggest world of them all, Second Life is a place with millions of players all over the world, making some of the best and most beautiful place you will ever see in a virtual world. Whole cities full of shops or clubs have sprung up in this game, and there is almost no end to what you can explore. And so we bring to a close our list of the best Downloadable Virtual Games and we hope that you have found some inspiration here. Playing these games is easy and fun to do and we feel they are all well worth the few moments it will take to get them running. Enjoy and explore these amazing virtual games and see what amazing things are waiting for you.